“Indeed, bamboo is like a man of virtue. From deep and resolute roots, straight and honorable stems extend toward the sky. 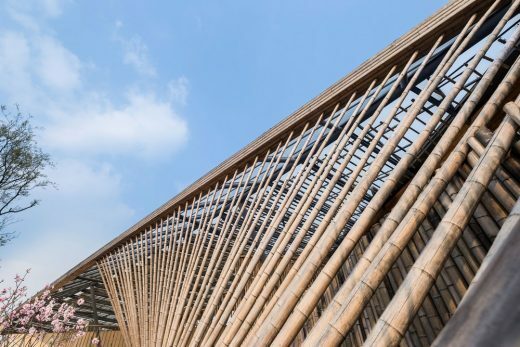 When a gentleman contemplates the nature of bamboo, only a feeling of integrity can come to mind.” Excerpt from Planting Bamboos, by Bai Juyi. 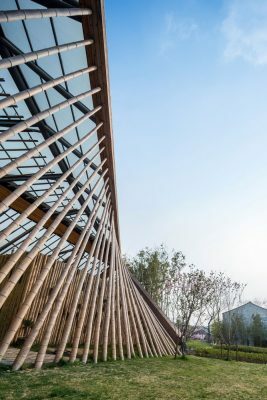 Since ancient times, Chinese writers and poets have shown a deep appreciation for bamboo. By praising the beauty of exquisitely crafted gardens, these gentlemen created an extensive cultural history immersed in a unique richness of textures. 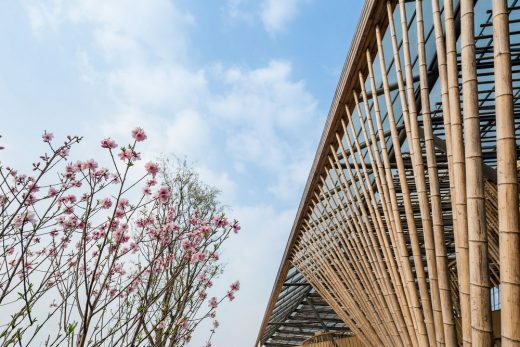 New Pastoralism’s Lecture Hall sits at Yangshan –a town close to the city of Wuxi– and uses bamboo as the main building element in its design. 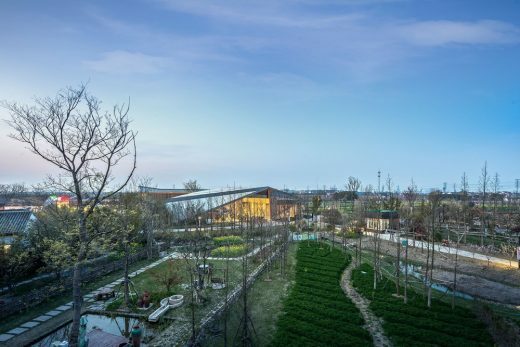 New Pastoralism’s Complex at Yangshan, Wuxi, is the first pastoral complex in China. 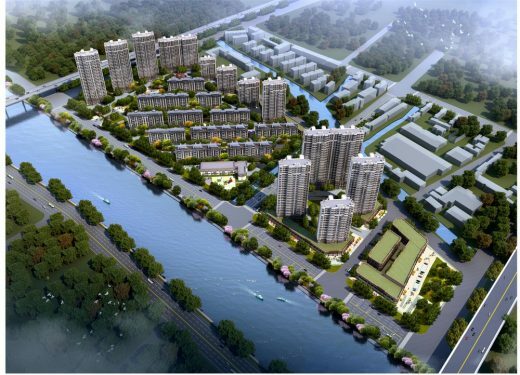 Located in Jiangsu –a province in Southern China–, Yangshan town is famous for growing delicious honey peaches in the suburbs of the renowned city of Wuxi, along the coast of the Taihu Lake. 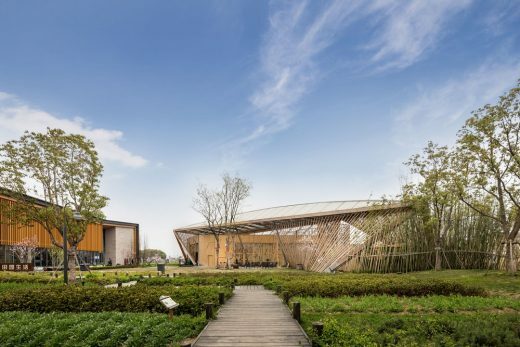 As the landmark of the complex, New Pastoralism’s Lecture Hall stands at the heart of the park, perfectly integrated into the pastoral scenery, almost like growing naturally from within. 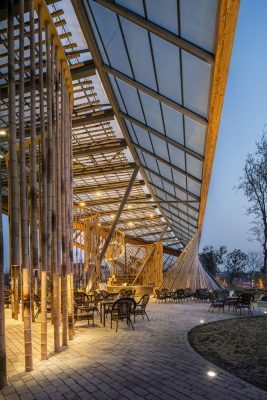 Composed by three distinctive areas, the venue’s indoors, the outdoors recreation area and an extension towards a vast green landscape; the construction covers an area of 1,618 square meters. 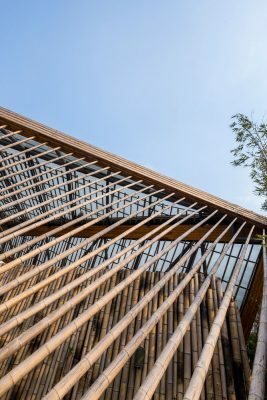 Given that the location was originally a bamboo forest; the architect Mr. Zou Yingxi respected the foundations of the area, to establish a dialogue between the Lecture Hall and the surrounding environment through the use of ecological materials, expressing and strengthening the meaning behind the “Site of the Pastoralism’s Declaration”, in the features of the building. 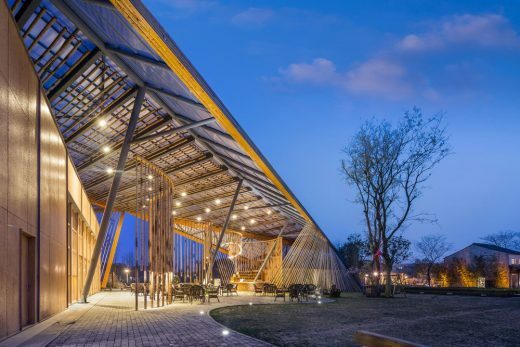 The building displays an irregular triangular shape. 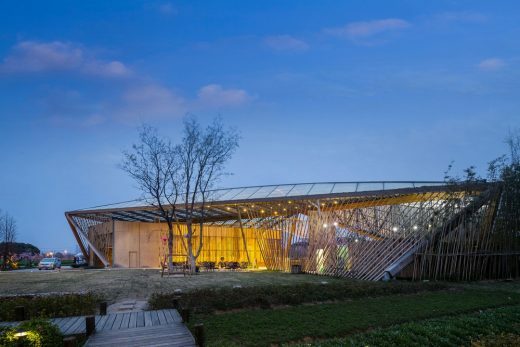 Observed from a distance, its body integrates the indoor and outdoor sections of the Lecture Hall into a grey structure that sits in the middle of the view to the park. At the same time, the contour of the area occupied by the structure equals the hypotenuse of its triangle. 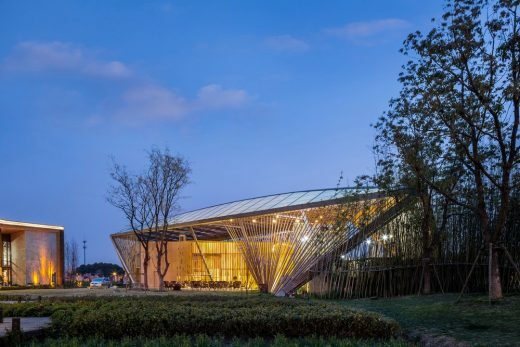 The upper and lower sections are connected with bamboo stems, as crossed elements that form a hyperbolical shape designed to penetrate the line of vision, forming a transparent space with a pulsating atmosphere. In this way, from every angle, the Lecture Hall presents unique and properly balanced modeling characteristics. 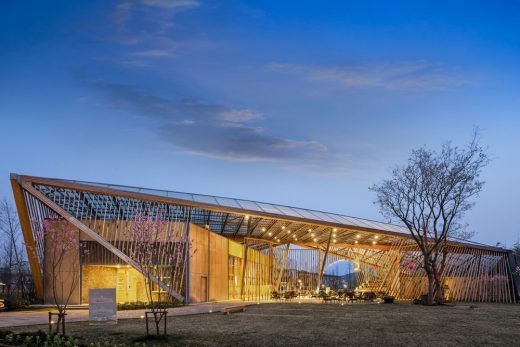 “Lightness” is one of the distinctive features of the Lecture Hall –light materials, nimble structure. 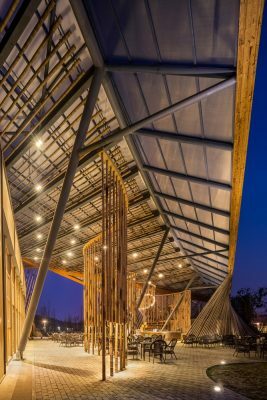 On the one hand, the building is made of a steel structure; the arched elements on the upper level make the roof even more transparent to “give way to” the sky. 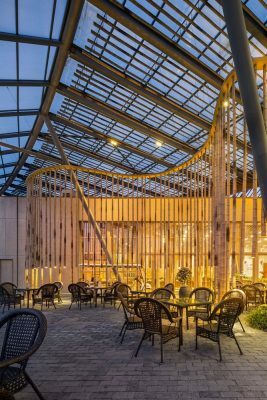 At the same time, the use of sunlight panels allows natural light to penetrate indoors, while the use of fish beam structures solves the span problem. 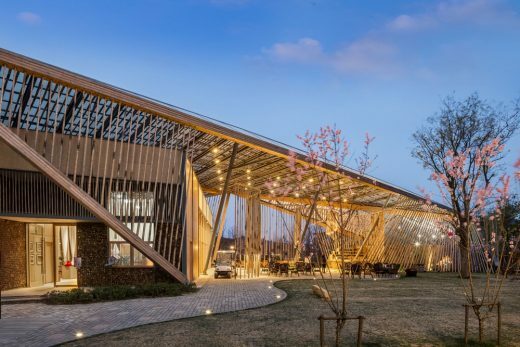 On the other hand, the building uses bamboo as a protective system. 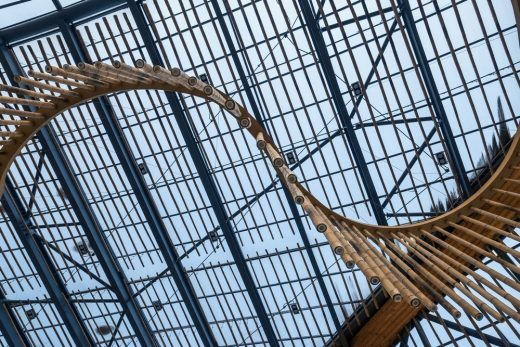 Its vertical support arrangement shows a rich and beautiful sequence, equivalent to a rope structure that creates reverse tension, eventually achieving proper balance of contrary forces to offset the structure. 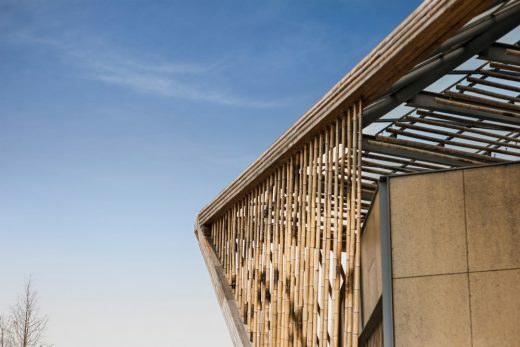 The entire project is based on the concept of “integration”, of interpreting landscapes, people and architecture, people and the environment, as well as materials and landscape. 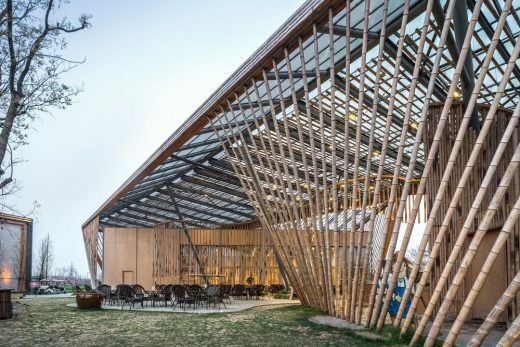 The large number of bamboo elements does not affect air circulation or air penetration, as the holes between the bamboo stems and their thin dimensions produce effects of “permeability” and “integration”, making the pastoral scenery harmonize with the structure, giving the sensation of an open space. 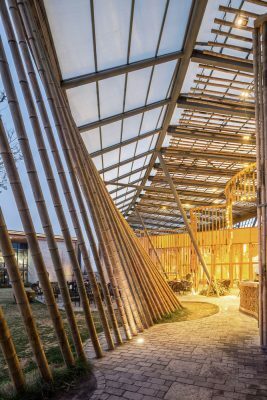 Undoubtedly, bamboo magnificently represents dialogue with the surrounding area, delivering a sense of security, without compromising the appreciation of the visual atmosphere, granting the Lecture Hall with a unique aura, almost as if it were growing from the soil itself, as a natural and unobtrusive living being. 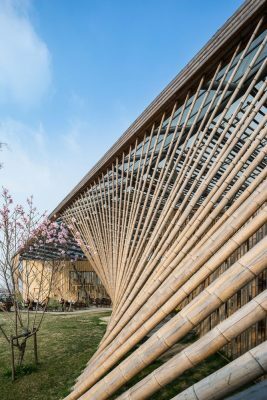 From yet another perspective, the fact that bamboo elements are present from beginning to end in the project denotes an ecological nature. 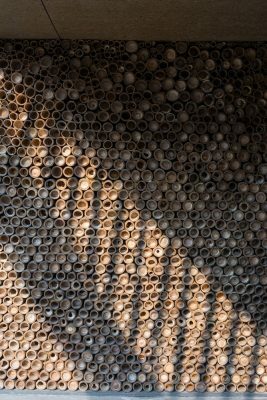 The hollow nature of bamboo is cleverly used to hang beautiful bamboo lamps, while bamboo and wood are combined to form an extension of the bar; also, bamboo and strawboards are used to build the façade… The architect transforms bamboo, from a simple local material, into the very definition of an expressive language for sustainability in buildings. “The final interpretation of a building can only be achieved through the provision of definite content into its empty spaces. In this case, this implies the use of natural materials that portray real space on empty spaces, while every notion of reality serves emptiness at the same time.” When the designer harmoniously unifies incompatible design philosophies with the ideology of pastoralism, the result is an amazing example of unification between urban and rural dimensions, generating a new concept of sustainable architecture. Commissioned by: New Pastoralism Investment Co., Ltd.
Construction company: Huacheng Boyuan Construction Engineering Co., Ltd.